The Frisch’s Big Boy leadership team, along with Washington Court House city officials, celebrated the opening of the remodeled restaurant at 1815 Columbus Ave. this week. The following participated in the ribbon cutting, left to right: Tim Downing-Fire Chief of Washington Court House Fire Department, Eric Miller-Frisch’s Area Coach, Bob Ritter- Frisch’s EVP of Operations, Cheryl White-Frisch’s Region Coach, Joseph Denen-City Manager of Washington Court House, Jason Vaughn-Frisch’s CEO, and Tom Youtz- Fire Chief of Washington Court House Fire Department. 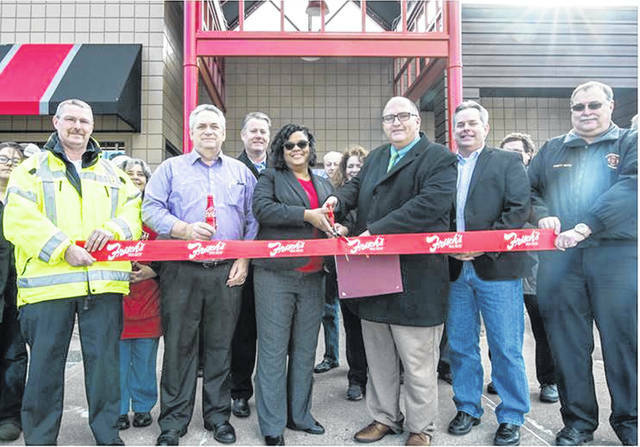 https://www.recordherald.com/wp-content/uploads/sites/27/2018/11/web1_image003.jpgThe Frisch’s Big Boy leadership team, along with Washington Court House city officials, celebrated the opening of the remodeled restaurant at 1815 Columbus Ave. this week. The following participated in the ribbon cutting, left to right: Tim Downing-Fire Chief of Washington Court House Fire Department, Eric Miller-Frisch’s Area Coach, Bob Ritter- Frisch’s EVP of Operations, Cheryl White-Frisch’s Region Coach, Joseph Denen-City Manager of Washington Court House, Jason Vaughn-Frisch’s CEO, and Tom Youtz- Fire Chief of Washington Court House Fire Department.